Artist/Author: Jackson, Stephen and Colin Groves. Utilises the latest morphometric and genetic research to develop the most up to date and comprehensive revision of the taxonomy of Australian mammals undertaken to date. It proposes significant changes to the higher ranks of a number of groups and recognises several genera and species that have only very recently been identified as distinct. 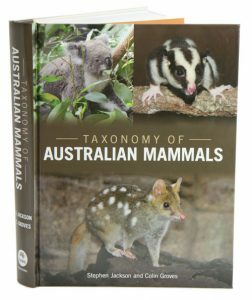 This easy to use reference also includes a complete listing of all species, subspecies and synonyms for all of Australia’s mammals, both native and introduced as well as terrestrial and marine. This book lays a foundation for future taxonomic work and identifies areas where taxonomic studies should be targeted, not only at the species and subspecies level but also broader phylogenetic relationships. OUT OF PRINT. Explores Gould’s beautiful images of our animals, knowing that some are no longer with us, and some are fighting for their lives. 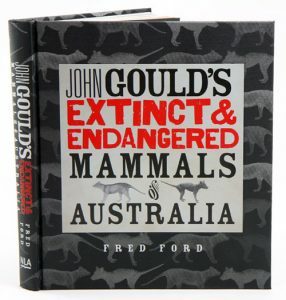 In this book, author Fred Ford compares Gould’s world, and the world that the animals lived in at that time, with the Australia we live in today. This book looks at 46 Australian mammal species that, today, are threatened or extinct and that were portrayed in the lavish colour plates in John Gould’s 1863 publication, The Mammals of Australia. Accompanying the pictures are accounts of the animals as they lived in the relatively untouched Australia that John Gould knew, and evidence of the attitudes of European settlers towards the native fauna.